The traditional and original lasagna, of course, is an Italian dish made with wide and elongated noodles upon which are placed layers of meat, tomato sauce and other ingredients such as onions, black olives, ricotta cheese, etc. With Mexican lasagna, the ingredients are those common to Mexican cooking, and in lieu of noodles, soft corn tortillas are used. See how some of the avocado is mushed? That’s the JUST RIGHT level of ripeness. Some folks buy avocados that are not ripe enough and wonder why their finished product didn’t turn out well, or was difficult to produce. Wonder no more. Get ‘em SOFT! Here’s the prep: WASH ALL VEGETABLES – INCLUDING AVOCADOS AND CILANTRO – IN SOAPY WATER WITH A CAPFUL OF PLAIN UNSCENTED HOUSEHOLD BLEACH!! Then rinse & dry. Onions get a pass since they’re peeled. Use a pressure cooker to prepare the (dry, of course) pinto beans with sausage & bay leaves, black pepper, garlic powder, basil, oregano, and salt. Remember to REMOVE the bay leaves after cooking. Why? Ever swallowed a bay leaf? You don’t want to. It hurts. They’re very hard and tough. Even pressure cooking doesn’t soften them up sufficiently. If you can find some ground bay leaves, go for it! Problem solved. See how the top is being finished? It’s becoming decorative. 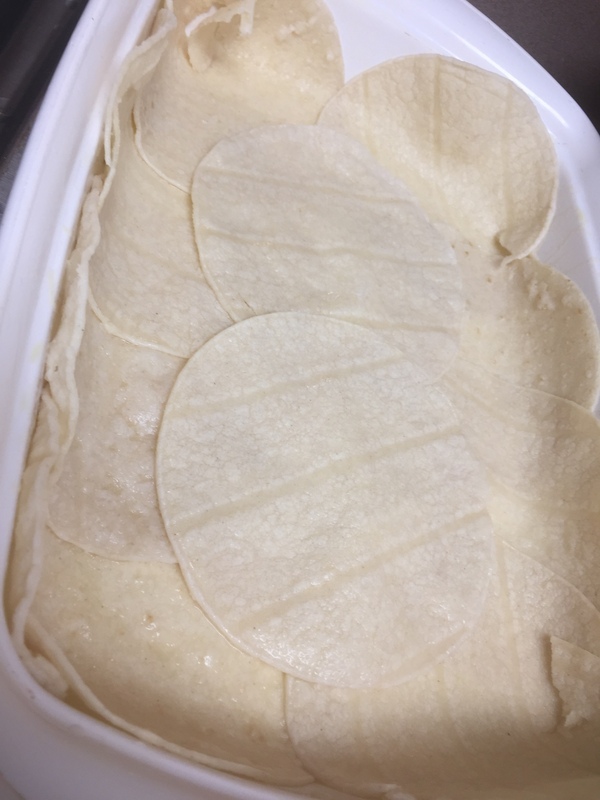 I soaked the soft tortillas in water to make them more pliable. They could also be steamed. Line a casserole type dish with them as seen. Be sure to cover the sides. Cook the chorizo and ground beef together. Julienne (thinly slice) the bell peppers. Finely dice the jalapeños. (Might want to wear a disposable pair of gloves for that task.) Slice and/or dice the onions as you wish. Chop the cilantro. Slice the tomatillos. Shred the PepperJack cheese. Slice/dice the olives as you like. I put some mole sauce atop it all, and sliced some avocado atop it all. I used a mole paste and added to it what I wanted, which was extra chocolate powder, garlic powder, black pepper, cumin, and combined it with tomato paste, to which I added the black olives brine, juice from the diced tomatoes (both add extra flavor, you know), and tap water to the desired consistency. Spread the sauce on the soft corn tortillas. Then layer on some meat. Add the vegetables, pinto beans with sausage, salsa verde, diced tomatoes, black olives, etc., cheese, crushed tortilla chips atop them, and if desired, add another round of sauce. A note on the avocados: Don’t cut your hand while removing the pit. If you’re not experienced enough to use a knife for that purpose in the traditional way, or if the seed is small, or avocado ripe enough, just use a spoon, or gently pry it out with the knife tip. Then spoon out the whole meat from the shell (the avocado should be soft, and skin should be black, yielding to gentle pressure), and slice it. It works best with the flat side down on the cutting board. Repeat the process with another layer of soft tortillas, vegetables, meat, beans, cheese, etc. Finish as desired. Cook in the oven about 30 minutes+/- at between 350°F–400°F. The process/progress pics are herein. This entry was posted on Friday, February 1, 2019 at 8:06 PM	and is filed under - Even MORE Uncategorized!, - Transfer: How do we get THERE from HERE? (Add a 'T'.). Tagged: cooking, food, how to, lasagna, Mexican, recipe. You can follow any responses to this entry through the RSS 2.0 feed. You can leave a response, or trackback from your own site.